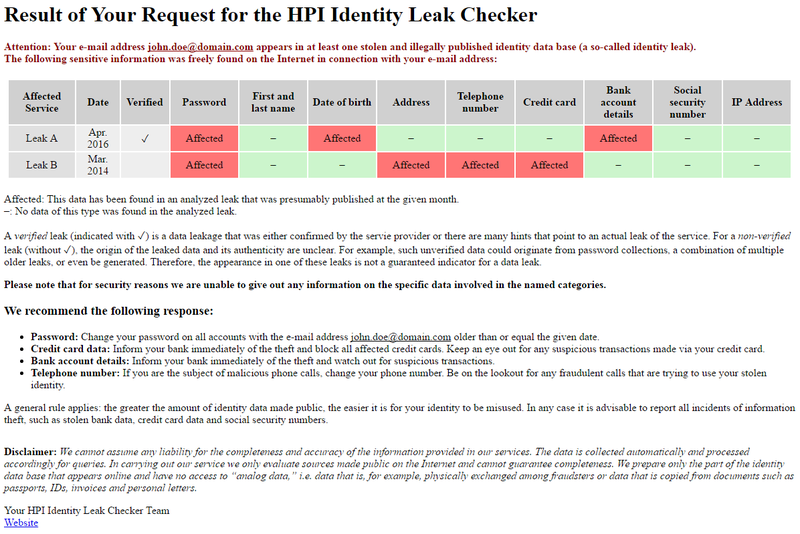 Our response emails are sent automatically from the address sec-checker-admin(at)hpi.de. Below are two examples of emails of a positive result (we did find your data in our data base) and a negative result (we did not find your data in our data base). The dates on the red background indicate the type of identity information that has been determined as in danger. The leak date provides the presumable publication date of the data. The minus (–) on the green background indicates that no such data was found in the leaks we processed. There is, however, no guarantee that there could not be public data sources containing the information in the green areas. Our response emails are digitally signed to ensure authenticity. Below are the public keys that can be used for the verification of the signature.